Time is upon us, i have recieved and compiled the submissions for the 27th Warlocks Journal contest. The winner had the guile to butter me up by using and referencing Background lore from my blog post about the Nel’dratha Dragons, i confess it most likely worked. But the deviousness of the ‘why’ behind the hiding place of the TRUE NAME spoke to me, not so much the hiding place itself but the reasoning for it, along with some good writing that actually hooked me. The other entries was fantastic as well and truth be told i was close to pronouncing everyone a winner, but meh. The other entries had complexity and plotting spectacular and just up my conspiracy mind’s alley, not to mention hiding place puzzles tantalized my GM heart. In all honesty, i suspect that combined all entries would be exactly what i had envisioned and at the moment i intend to attempt to mash them all into one cohesive TRUE NAME story. so.. now i shall give you the winning entry! Alasteir worked feverishly at the numbers scribbled before him on the rough parchment. Outside he could hear the battle raging as Ruaâ€™thorâ€™s men fell before the onslaught of the Nelâ€™dratha dragon that was nearly upon him. Being a proxy of the Shadow Council, Alasteir had access to great powers and his specialty was divination. As such he took upon the nigh impossible task of ferreting out the True Name of the Nelâ€™Dratha Queen, a quest which many would have felt was certain to lead to either failure or death. â€˜Likely both at this point.â€™, Alasteir thought to himself as his calculations neared completion. It was then that Ruaâ€™thor burst through the door into the chamber where Alasteir had hidden himself away. â€œNo more than a minute.â€, the Lion man gasped breathlessly, his body drenched in sweat and blood. Ruaâ€™thor then turned back towards the door, the twin amethysts which hung about his neck swinging as he moved. The wounded hero then gave a silent prayer and clutched the gems with one hand and his sword with other as he waited for the inevitable. With a great roar that echoed with the screams of a thousand damned souls, the corpse that was a great Neâ€™dratha dragon tore apart not only the door that Ruaâ€™thor stood behind but the entire wall it was attached to. 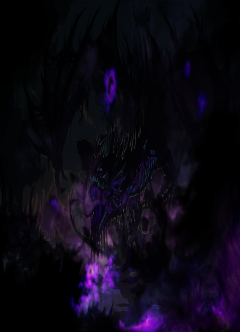 It then reared up, wings dripping black tar and amethyst eyes glowing a hellish purple light that mirrored the color of the gems Ruaâ€™thor wore about his neck. Pausing a moment as if to build anticipation, the dragon then lunged its fanged maw down towards the ready warrior who stood poised, hoping his amulet would protect him from the very type of creature it was forged from. Ruaâ€™thor had only a fraction of a second to absorb this information before the dragons fangs were upon him, breath smelling like a mountain of rotting dead. The warrior then let out a great roar before hurling himself not away from the Nelâ€™dratha dragon but towards its assault, the creature instantly gulping him down. Alasteir looked startled for a moment before he realized that he was very likely next as he watched the dragon shake its head, swallowing the meal that had so graciously offered himself to it. Turning around to what remained of the room he was in, Alasteir sought out his magic staff which would be his last, if futile, line of defense. He barely had time to dig it from the rubble before the charnel smell of the dragonâ€™s breath blanketed him. Alasteir felt his flesh start to decay off his bones as his grip weakened on his staff. His legs failed him next, their lack of strength causing him to collapse before the Nelâ€™dratha dragon. Just before he lost consciousness, Alasteir found himself wondering whether his face too would be seen forever more writhing on the wings of this great beast. Blinking his eyes open, that same thought crossed Alasteirâ€™s mind again. Was he looking outwards from the hell of his soul being trapped forever inside an undead monstrosity? Seeing Ruaâ€™thor sitting beside him, bloody and covered in foul smelling ichor, Alasteir realized both he and his ally had survived despite all odds. Ruaâ€™thor was carving at something and as Alasteir weakly sat up, he saw it resembled a black and shriveled heart. Ruaâ€™thor had done it! â€œIs this what you wanted?â€ Ruaâ€™thor asked, peeling tough layers of heart muscled away with his blade, forged to withstand even the wilting powers of Nelâ€™dratha dragon flesh. As Alasteir looked at the name, he silently thanked the Shadow Council that his theory was correct. The method the Nelâ€™dratha Queen used to animate her servants was to mystically enscribe her true name within them, allowing them to use her power but to never have any ability to control it. In that way, the Queen could strengthen and weaken them as she saw fit. â€˜Nelaylmawetsedrathaâ€™ was the word inscribed on the inner folds of the fallen dragonâ€™s heart and it was this True Name that Alasteir knew could used to accomplish feats both great and terrible, all in the name of the Shadow Council. Next contest is in July, if you want to stay updated on Warlocks Journal i have created a newsletter just for this, so you want to stay informed go Sign Up Now! Next post: Angry Warhammer or What have I done lately?